Cleaning of vehicles using a Wash Down Pit solution. In limited spaces, numerous vehicles require a wash-down from the top to the undercarriage of the chassis in preparation for an MOT. The features of a wash-down pit include a large built in settlement tank with a weir, a flow forge floor and hose connections. This style pit allows a vehicle to be washed above and below at the same time, saving on time and space in the workshop and only requires 10m of yard space. It allows the customer to prepare all vehicles for MOT ‘s as well as routine cleaning efficiently. Why choose a Premier Wash Down Pit? Structural Calculations for 20 tonne per axle in normal ground conditions, site specific when required, up to 50 tonne. Options for IP65 LED lights. 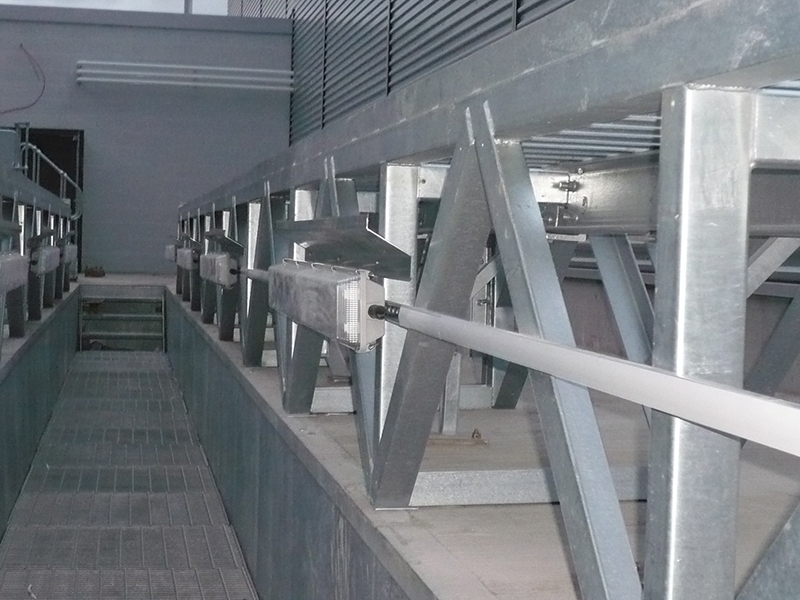 Anti-slip steps, Elefant tread – Galvanised. Integral sump fitted as standard, no pump. Unique bond of steel to concrete – Solid. Lattice work, not sprags. All installation staff employed directly. Cleaning of vehicles using a combination of wash down pit and a ramp solution. 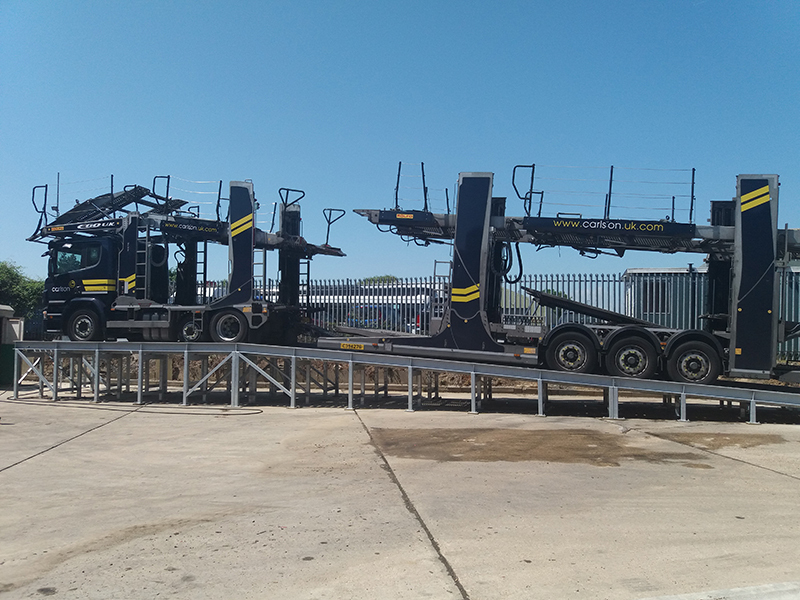 Due to many garages having logistical constraints in their premises such as width and height as well as challenging ground conditions. Premier Pits designed this bespoke design. 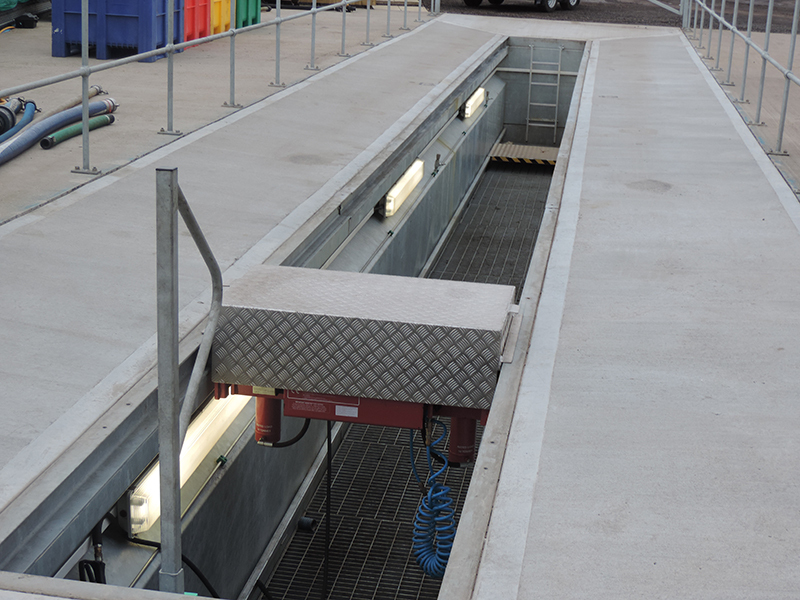 The features of a wash-down pit including ramps either side of it, allows the end user to get a facility which accommodates the water to be collected into the built in settlement tank located in the pit and the ability to wash the parts of the vehicle from the slab. The yard space required for this is 19.5m yard. This pit has tanks with a weir (the same as a wash down pit), with the floor being constructed of flow forge floor (so water drains through it) and hose connection to facilitate washing tools. 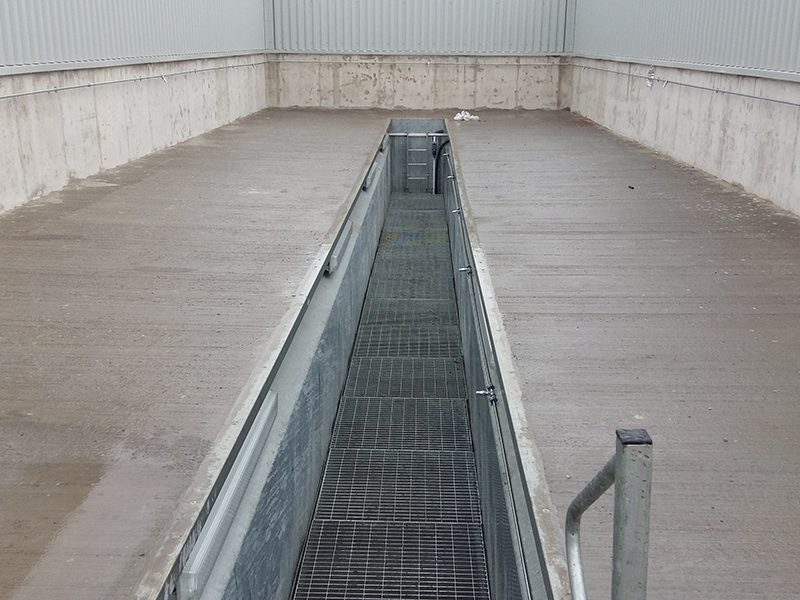 As the client’s business was located on gravel/sand ground conditions we wanted to reduce the risk of a wash down pit installations having problems with ground conditions and temporary works costs. 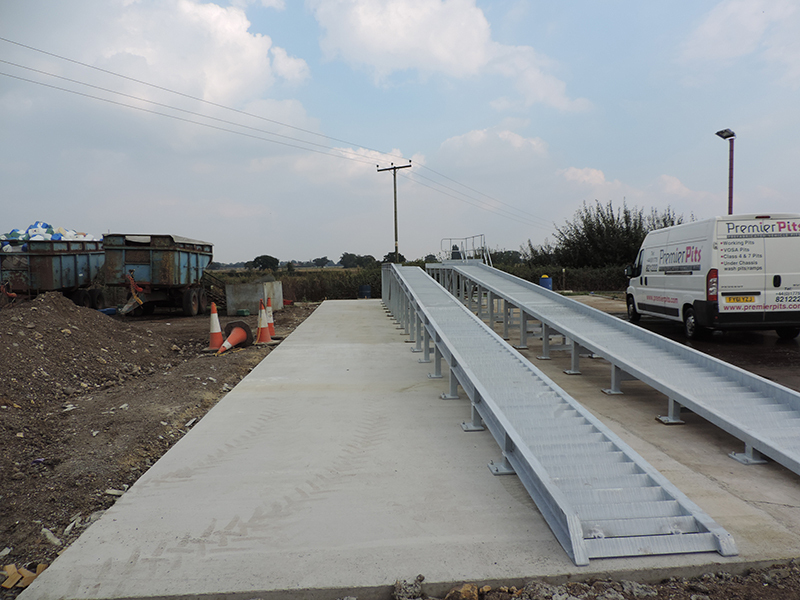 Therefore, we designed a half pit/half ramp solution, to mitigate costs with additional ground works, but allowing operatives to enter a shallower pit once the vehicle was driven onto the ramp. It allows the customer to prepare all vehicles for MOT ‘s as well as routine cleaning efficiently. 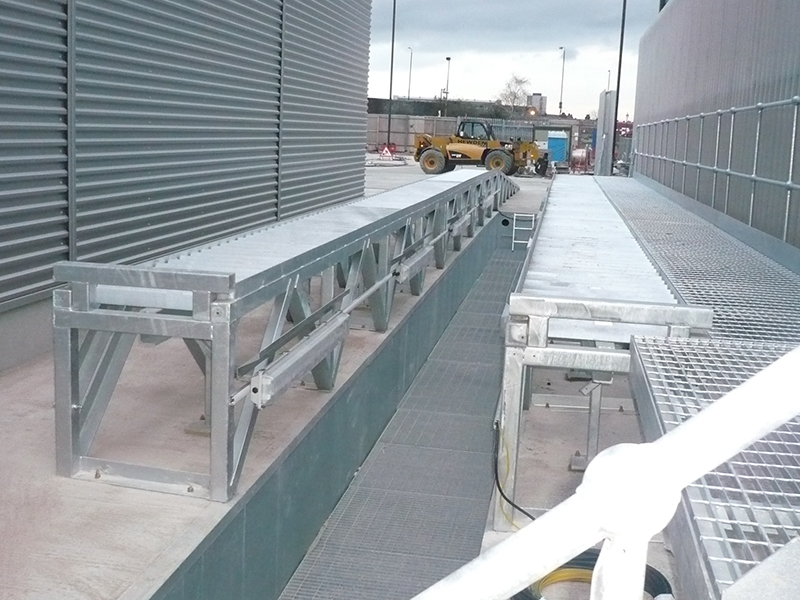 This solution works commercially to clients who have logistical restrictions as well as difficult ground conditions. Why choose a Premier Wash Down Pit and Wash Down Ramp? Cleaning of vehicles using a wash down ramp solution. Numerous vehicles require a wash-down from the top to the undercarriage of the chassis in preparation for an MOT. 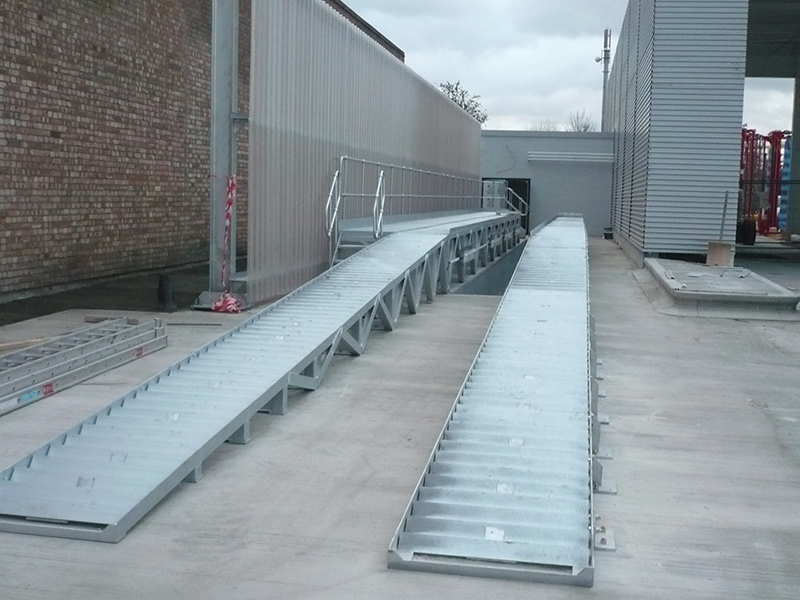 The features of a wash down ramp allows operatives to clean vehicles on a safe, fully structurally calculated CE marked ramp. These have been designed with a safe landing platform for the drivers to exit the vehicle. It allows the customer to prepare all vehicles for MOT ‘s as well as routine cleaning efficiently. This solution works commercially to clients who don’t have logistical restrictions. 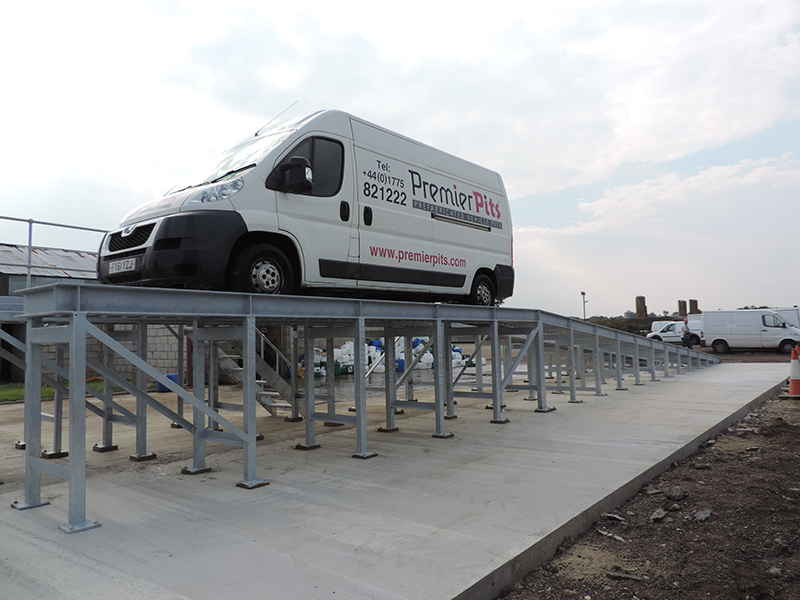 Why choose a Premier Wash Down Ramp? Structural Calculations for 8 tonne axle loadings. Safe working load up to 40 tonnes. All our works are CE certified. All wash down ramps are galvanized. 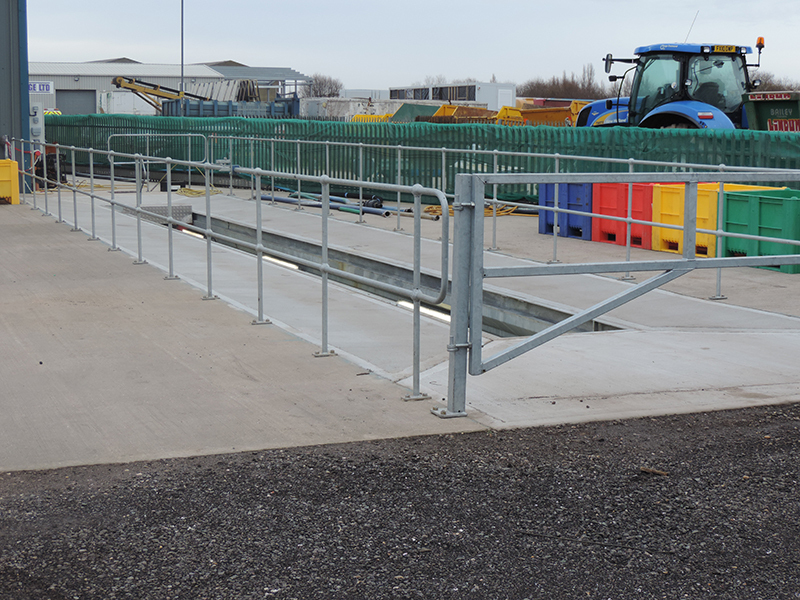 Galvanised landing platforms can be installed on the left/right-hand side or on both sides of the ramp with handrails. 10 year warranty on Premier Pits installation. *Please note all clients need to discuss what slab they are locating these Ramps on to so we can discuss if the loadings can be transferred down to ground through the slab.